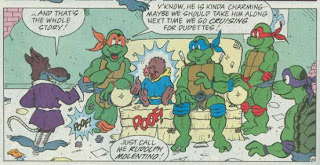 Down in the lair, the Turtles have found themselves with way too much downtime. They begin arguing over the TV and a lot of rough-housing follows. Splinter, disturbed by the lack of focus and cooperation between his sons/students, decides to take his meditation to the beach for answers. While contemplating the situation, he is approached by Cudley the Cowlick. Splinter relays the info and Cudley is reminded of a story. In another dimension, there lived a horde of barbarians that worshipped all earthly pleasures while refusing the spiritual. They invaded a land called Glum, which was populated by mystics, and drove the citizenry away. Before leaving, however, a witch enchanted a mole, giving him the ability to project illusions and mess with peoples’ heads. The mole took on the persona of Phineas T. Headrush and stayed behind to torment the barbarians with practical jokes and mind games. 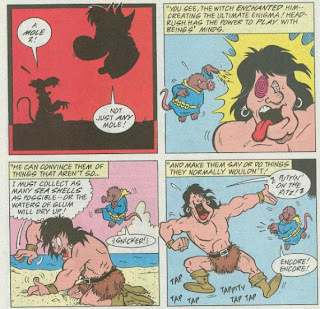 Cudley explains to Splinter that, due to his space-time mastery, he actually has control over Headrush, as Headrush fears Cudley might go back in time to the moment before he was enchanted and reveal his origins to the Barbarians. With Splinter’s approval, Cudley fetches Headrush to teach the Turtles a little lesson. 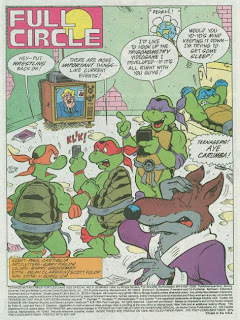 Returning to the lair, Splinter interrupts another feud between the TMNT (this time about 90s action movie heroes). Disappointed in his pupils, he orders them to go for a walk forward through the sewers and not to return until their path brings them full circle back to the lair. As they start their journey, the Turtles immediately begin whining. Headrush then appears to them, introduces himself, and promptly vanishes. Confused, the Turtles continue on when they find themselves trapped on a conveyor belt headed toward a pair of grinding gears. The Turtles all look to Don to use his mechanical genius to save them, but a strange yellow glow around his head stupefies him. Raph then comes to the rescue, jamming the gears with his sai and rescuing his brothers. Moving forward, Raph finds himself trapped in a ring of fire. Normally he’d just leap to safety, but the strange yellow energy stupefies him, too. Mike then jumps in, spinning his nunchakus like fan-blades, blowing out the fire. Before Mike can gloat too much, a giant pizza monster appears. Mike is typically the most knowledgeable on how to deal with pizza, but again, the yellow energy stupefies him. Leo then slices the pizza up with his katana and helps Mike to his feet. Leo spots a light at the end of the tunnel, but before he can guide his brothers to it, dozens of spears start flying toward them from nowhere. Leo is stupefied by the yellow energy, leaving Don to deflect all the projectiles and begin leading his brothers down the tunnel. Leo comes to and the Turtles finally realize the lesson they’ve just learned. The stupefying energy forced each Turtle to pick up the slack of their paralyzed brother and solve problems they’d normally never deal with. Now with a greater appreciation for what each Turtle brings to the team, the TMNT are ready to head to the light at the end of the tunnel. Opening the door, they find themselves in the lair; they’ve come full circle. Splinter introduces them to his partner in crime, Headrush, and reveals that he set the whole thing up. The Turtles are fine with it, though, as the lesson was worth the hardships. *Headrush will return in “Be a Star”. *Due to the lack of Ninjara but the presence of Cudley the Cowlick, this story has to take place somewhere between the story arcs of TMNT Adventures #22 and TMNT Adventures #28. Personally, I just slap it in after TMNT Adventures #25 because eh, why not? *Cudley the Cowlick last appeared in “Cleaver’s Critters”. 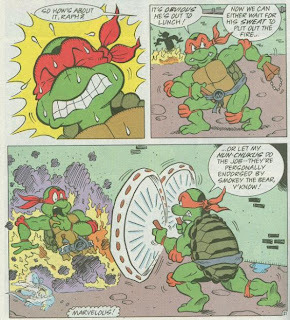 “Full Circle” is the kind of story I wish I could place way earlier in the series, like between TMNT Adventures #4 and TMNT Adventures #5, as it deals with the Turtles acting pretty immature and learning a simple lesson. Cudley, though, throws a wrench into the mix and due to that, it’s basically a story where the Turtles forget everything they’ve ever learned and regress back into simpletons for the purpose of relaying a generic message about teamwork to the audience. Boooo! Letterer-turned-artist Gary Fields offers a competent style, though it lacks anything flashy to make it pop. It’s very simple and ho-hum; kind of like Dave Manak’s tenure on Archie’s Sonic the Hedgehog. Not bad, no, but the book is capable of looking so much better. Fans give artists like Milton Knight with strong and unique styles a hard time, but I’d much rather have them than anything this bland-looking. Headrush is nothing more than your standard Mr. Mxyzsptlk archetype; the impish creature from another dimension that enjoys using its magic powers to alter reality and prank our heroes. Such a narrow and specific character archetype, yet you’d be shocked at how many comics and cartoons resort to making their own carbon copy. All things considered, Headrush isn’t particularly annoying, like Bat-Mite or anything. In fact, he’s hardly there at all. His traps and puzzles are ever-present, but he rarely says anything beyond some generic commentary praising the Turtles’ responses to his handiwork. “Be a Star” will give you a better feel for the character and it’s definitely the better story in this Special, thanks exclusively to Stan Sakai’s artwork (but we’ll talk about that when I review it). “Full Circle” commits perhaps the worst offense imaginable: It’s just plain forgettable. From the art to the script, there isn’t anything noteworthy about this installment. At least bad comics like TMNT Meet the Conservation Corps #1 or The May East Saga will stick with you for their bad art or incompetent scripting. This? You can’t even make fun of it. "At least bad comics like TMNT Meet the Conservation Corps #1 or The May East Saga will stick with you for their bad art or incompetent scripting. This? You can’t even make fun of it." "It’s very simple and ho-hum; kind of like Dave Manak’s tenure on Archie’s Sonic the Hedgehog." Man, only Mark Pellegrini can drop references like that so naturally!